A team of four Cristo Rey De La Salle students is assigned to cover a full-time equivalent (FTE) role during the academic year. The Corporate Work Study Program apportions students by work days. 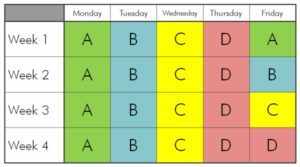 Each student is assigned a work day — Monday, Tuesday, Wednesday, or Thursday. Fridays are covered on a rotating basis.